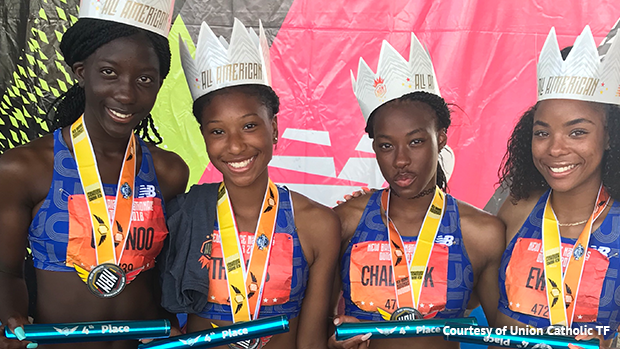 The Union Catholic girls, running in the fastest shuttle hurdle race in U.S. high school history, broke its own state record by running 58.30 to place fourth at the New Balance Nationals on Saturday at Aggie Stadium on the campus of North Carolina A&T in Greensboro, N.C.
UC's 58.30 broke the state record of 58.38 that it set at the 2015 East Coast Relays in Randolph. Amaya Chadwick, who won the 100 hurdles at the Meet of Champions, led off for UC with a 13.9 split. Felicia Quainoo then went 14.2. A'Liyah Thomas followed with a 15.4, and Brianna Ewing anchored with a 14.6. The race featured the two fastest times in U.S. high school history as Western Branch of Chesapeake, Virginia finished first in 54.67 to smash the national record of 55.06 that Western Branch ran to win the NB National title last year. Bullis of Potomac, Maryland also ran under the old national record with a US #2 all-time 54.95.